It’s Gonna-Gonna-Gonna-Gonna-Gonna… It’s Gonna Be MAY!!! But for the small fraction of people, May means that people are going to say IT’S GONNA BE MAY. 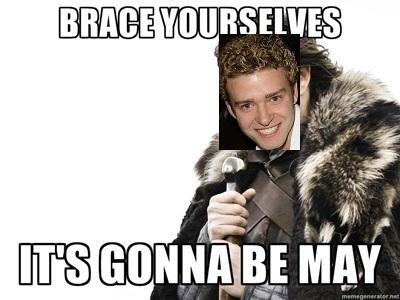 Since the year 2000, people have been making a meme out of the NSYNC song: “It’s Gonna Be Me” because of the way Justin Timberlake says Me which makes people think he’s saying May. According to Timberlake, producer Max Martin, who also helped write the song, wanted him to say it like that to make it sounded like he was from Tennessee in which Justin is from Tennessee. I remember this happening last year where Justin posted on his Facebook page that it’s going to be May and asking people if they could meme themselves. So guys, looks like this is an annual tradition that is going to last A WHILE.